id you think your Boaties Fry Pan was only good for a fry-up? 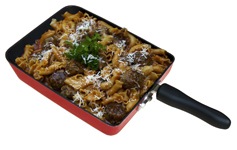 Ever since we sold the first Boaties Fry Pan, we wanted a cook book that complemented the versatility of our product. Whilst in a second-hand bookshop searching for recipes, we discovered Carolyn Humphries’ great collection of frying pan recipes . It was out of print but the publishers enthusiastically agreed to re-produce it as The Boaties Fry Pan Cookbook. With your Boaties Fry Pan and Cookbook, you can create everything from starters and snacks to complete meat, fish, poultry and vegetarian meals, delicious deserts, breads and treats. Use any chunky white fish for this dish. 1. Wipe the fish. Season with salt and pepper and sprinkle on both sides with a few drops of Worcestershire sauce. 2. Heat the oil in the frying pan and cook the fish, skin- side up, for 2 minutes. Carefully turn over. 3. Lay the tomato slices on top of each fish fillet. Mix the cheese and cornflakes together and pile on top of each. Cover with a lid or foil and cook for a further 3–5 minutes until the cheese melts and bubbles. Alternatively, cook uncovered for 2 minutes, then flash the pan under a preheated grill (broiler) until the top is golden and bubbling. 4. Serve straight from the pan with creamed potatoes and peas. If you are cooking for one, use half of one pepper rather than a quarter of two, if you prefer. However, it’s best to cook at least enough for two people – the vegetable mixture is delicious cold as a salad the next day. 1. Toss the pepper, aubergine and courgette slices in the oil. 2. Heat the frying pan. Add the pepper slices and fry (sauté) for 2 minutes on each side. Push to one side of the pan. 3. Add the aubergine and fry for 1–2 minutes on each side. Repeat with the courgette slices. 4. Spread all the vegetables out again. Sprinkle with the garlic and sun-dried tomato. Turn down the heat and cook for a further 3 minutes, turning occasionally, until all the vegetables are just tender but still holding their shape. Serve hot.